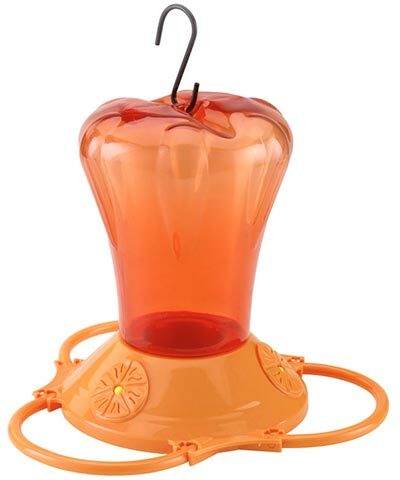 Offer unique and beautiful orioles their own feeding spot with the Stokes Oriole Bird Feeder. Inviting elusive orioles into your backyard certainly enhances your bird watching experience, and this feeder will offer them a wonderful treat. The large, orange reservoir holds a generous 34 ounces of oriole nectar, and its tapered design evokes a balloon. This reservoir threads into the included, orange plastic base, and a faux orange slice shape creates each of the three ports. An extended perch around each port forms resting spots for orioles, while a yellow guard in the center of the port protects nectar from insects. Its plastic construction makes the item perfect for getting children interested in birding, and the reservoir removes from the base to clean and refill it. An included "S" hook enables the feeder to hang from a branch or bracket easily. Add bold color to your yard and highlight your appreciation for orioles with this Oriole Bird Feeder.